Love That Max : Why shouldn't students with special needs earn varsity letters? Why shouldn't students with special needs earn varsity letters? It seems like it ought to be a given: Athletes with special needs should have the same chance to earn school varsity letters as other athletes, celebrating their own unique achievements. If a school doesn't allow that, it's discriminatory. Yet that's exactly what's been going on at East High in Wichita, Kansas, as the world discovered last week when the story of Michael Kelley—a teen with Down syndrome and autism—went viral. Today, a classmate will be presenting her Change.org petition at a Board of Ed meeting, it's already racked up close to 43,000 signatures in support of allowing students with special needs to earn varsity letters. 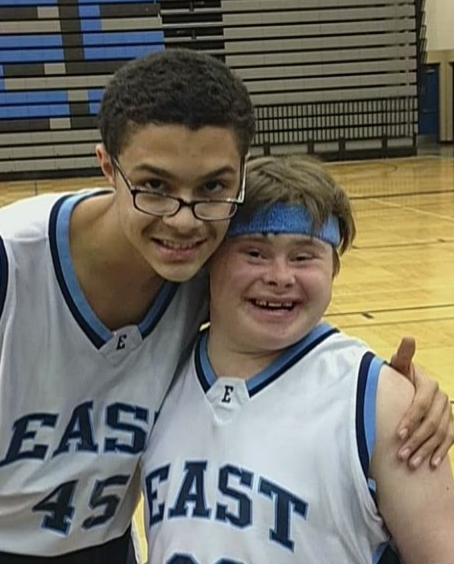 Michael participates in an extra-curricular basketball team for kids with special needs, reported ksn.com. To encourage her son his mom, Jolinda, bought him an East High varsity jacket and official letter. Only it seems another parent wasn't pleased that Michael was wearing that jacket. While at school, Michael was told to remove it and gave him a sweatshirt to wear instead. How mortifying that must have been for Michael, for starters. Couldn't they have just waited till the end of the school day, if they had to ask him to remove it at all? According to East High Principal Ken Thiessen, the school was following policy: Only athletes on varsity teams can wear a varsity letter. When asked by a reporter if the school would ever consider giving kids with special needs a varsity letter, he said, "We have considered it, and our decision was no. We decided that it is not appropriate in our situation because it is not a varsity level competition." For sure, the students in the special needs athletic programming aren't competing at the standard "varsity level." But there is no comparison. They are competing at their level. The school should establish requirements for students with special needs to earn varsity letters. This isn't about giving these teens a free pass—it's giving them the recognition they deserve. There's no district policy on this in Wichita. In fact, the district Athletic Director noted that when he worked for another high school, they did allow students with special needs to earn letters. Of course, this raises big questions about what's going on at schools across the country, where I'll bet situations are similar to this one: It depends on the individual school policy. Happily, a growing number of schools now have sports programs for kids with special needs, thanks in part to efforts by nonprofits like Special Olympics Project UNIFY. Whether or not these athletes are treated as equals is a whole other question. Really, one our kids have to contend with in every facet of their lives. Why there's even a question about this is mind-boggling, like the one posted on the Facebook page of this Kansas City TV station: "Do you think special needs athletes should be eligible for varsity letters?" Why not? Assuming they meet the established criteria for getting a letter, they have every right to that honor. Libby Hastings, the classmate of Michael's who started the change.org petition, summed it up best when she wrote, "My passion is soccer and I wear my varsity letter with pride. It's a symbol of all my hard work and the love I have for my school.... Michael works just as hard as I do, shows just as much passion, and loves our school deeply. He deserves to be awarded a varsity letter just as much I do." Meanwhile, the principal and athletic director of nearby Santana High School, Mark Calvin, sent Michael an official varsity letter along with a note: "You can be a part of something anywhere you want to." Michael deserved it. I do not see this as a case of lowering standards for a student with special needs but rather embracing them as members of the school community and recognizing their athletic accomplishments. I love sports. Sports is the great "equalizer" to many kids, maybe they cannot read as well but they can hit a ball, right? To try to elevate a high school player, usually between 14 to 18 years old to a position where only "they" can were a certain coat is the kind of thing that is wrong with youth sports! Yes, high school VARSITY is a youth sport. I cannot believe anyone would ever think this was ok. NOT ok. This is one of those times where my issue isn't that the school did it in the first place, but that they didn't reverse their decision upon learning all of the facts. (Though, obviously, your point about doing it in the middle of the school day is a valid one). Fact #1: Michael did not earn his letter by participating on one of the school's Varsity teams. Ok, fair enough. Fact #2: Someone was upset enough about this to complain. Well, personally, in this case, I think the school should only care if a student, rather than a parent, complained, but fine, whatever. Half a point. So far, I understand the school's reasoning, and I even understand them asking Michael to remove his jacket (though, not, as you say, in the middle of the school day). But now we get into the other facts. Fact #3: Michael's mother did not buy her son a Varsity jacket because she thought it would be cute, or cool, or because "he wanted one", or whatever. She did so because she felt her son had achieved a high level of athletic proficiency within the confines of his limitations. Should she have done so without talking to the school first? Probably not. But it still isn't as though she did it because her totally non-athletic kid wanted her to. Fact #4: The school appears to have no option for Special Needs kids to earn a Varsity letter, either through participating in external sports programs, or through limited participation within the school's sports system. So we have here a separate-but-unequal situation: no matter how athletic he or she may be, no Special Needs kid ever has a chance to earn a Varsity letter at this school. Not cool. Fact #5: No student, as far as I can tell, ever mentioned, let alone complained, that Michael was wearing his Varsity jacket. (Notably, the petition to have Michael's letter "reinstated" was started by a fellow student at the school.) The sole publicized complaint came from a single (as in one, not as in unmarried) mother, who felt that Michael wearing a jacket with a letter he worked hard for somehow cheapened her child's accomplishments. Sorry, but grow up. If your kid was really upset by this situation, sit him down and explain to him that, like it or not (and we SN folks often DON'T like it), there sometimes have to be different expectations for different groups of people. And if it was you, the parent, who had the problem...well, see above, re: growing up. So yes: I actually do understand the school's knee-jerk reaction. What I can neither understand nor tolerate is how, after seeing all the factors in play, they continue to stand by their original decision, rather than correcting it. It seems like the requirements are the key thing here. Where I went to school, a letter was based on points for participation. So athletic students would make more teams and have a better shot at it, but it was theoretically open to anybody. However, since the requirement here is being on a varsity team, it sounds a fair decision. With my abilities, I wouldn't have earned the right to wear a jacket either. Changing the rule for students with special needs and not others sounds patronizing to me. Having said that, since it sounds like sports is this student's "thing", the school could consider what achievement options they can make available for ALL students who work hard, participate widely in sports, but won't be pursuing it as a career at a further level. Rewarding only talent at the high school level misses a lot when you consider all that is gained from participation in sports -- teamwork, discipline, etc. Last year during our 5/6 grade basketball season, I called the AD of our school (we are very small K-12 so everyone knows everyone else) and asked if Tess could have a basketball jersey like her peers so on game days, she could wear it along with them and feel like part of their group. She is totally non-verbal and has spastic quadriplegia so even if we had an SN sports program (we don't) it would be impossible for her to really participate. I offered to pay for the jersey myself and insisted that if he (the AD) didn't think it was appropriate for ANY reason, that it was okay, I understood. His immediate response was, "I should have thought of Tessie when I ordered them for the other girls and I'm sorry that I didn't. There is no way you're paying for it. She's a part of our school and is a Viking (our team's name) so she gets a shirt." Did she "technically" earn it? No. But there was no way for her to "earn" it in the traditional sense. Doesn't mean she didn't want to if she could have. Was she proud to show the girls her shirt on game day? Her smile when they all mentioned it to her spoke volumes. And they all thought it was great that she had one too (so did their parents when they saw Tess wearing it). My rambling point is, she would have NEVER gotten to feel that sense of pride and inclusion had the AD said, "Sorry lady, she doesn't play so too bad for her." Shame on the parent who complained. I love this story ! I love the lessons from it too. And I especially love the shame on the parent who complained because to me this isn't an issue that needs a policy per se but just students/parents/ administrators seeing situations with open eyes, hearts and desire for inclusion. These aren't obvious, slam-dunk issues. But what should be easy is to handle them with sensitivity and care. The school was incredibly ham-fisted in their response, and should have taken the opportunity to make new and better policy. Even Mom might have thought twice about taking it upon herself to "award" a letter when the school had no mechanism for it. Doing it that way nearly guaranteed some kind of negative reaction. Literally everyone involved here should have done better by Michael. I'm with you, Ellen, it makes me wonder about policies at other schools. There should be a way for some good model programs and policies to be widely disseminated so schools that don't know what to do can learn better practices. It would be nice if some school administrators would read about this story and propose well-designed policies in their schools because of it. This district's administration should read some of the Supreme Court decisions on "equal but separate"policies. They rule against such policies. Many school districts haven found this to be the case the hard way. 1) Students with special needs should OF COURSE be allowed to EARN varsity letters. 2) It's appalling this school/district does not and is unwilling to establish criteria that would allow students with SN to EARN varsity letters. Assuming a school district HAS established criteria for BOTH SN and non-SN kids to earn varsity letters -- well, then those criteria should be applied. Some schools award letters for making the varsity team only, other schools use other criteria (for participating, for participating + results achieved, etc). My kids attend a high school that established criteria for earning a letter that applies to ALL student -- you get a letter if you make a varsity team, period. It is (rightly or wrongly) based on accomplishment, not effort. There are all kinds of other school awards that recognize a kid's enthusiasm and effort -- but varsity letters are reserved for varsity athletes. Period. FWIW, neither of my kids made varsity -- but my eldest's BFF did. Twice, for sledge hockey. (BFF's an amazing girl who just happens to get around in a wheelchair). The years BFF didn't make varsity? She played intramural, had fun, didn't get a varsity letter and the sky didn't fall. (My kids also attend a HUGE school with relatively few varsity sports, so at least 90% of ALL kids, with SN and without SN, never get a letter). There should be criteria for students with disabilities to earn varsity letters if they cannot earn them traditionally. I would rather letter in band than in sports. My 19yo daughter participated in Special Olympics bowling for four years and received her high school letter just about a month ago. It felt legit compared to the academic letter she received in the fall. She's 19yo and only functions at a fourth grade level academically. I just couldn't celebrate that one with any good conscience. But the Special Olympic letter... that works. I think some of the responsibility in this situation has to be placed on the parents. At least I felt that way.